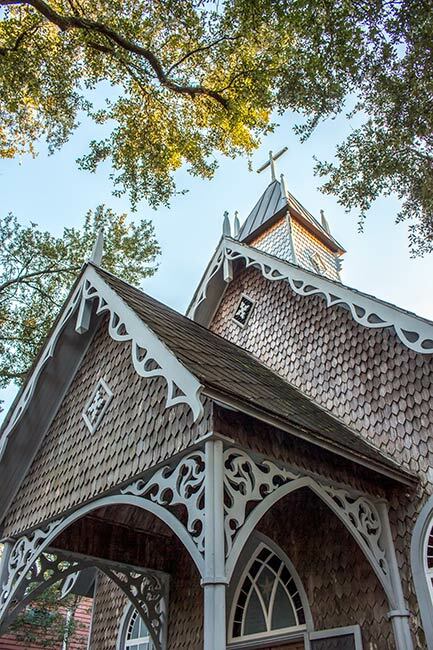 The St. James-Santee Episcopal Church in McClellanville was built in 1890 as a chapel-of-ease for the Wambaw Church within the St. James-Santee Parish. The parish was established in 1706 by the Church of England and served French Huguenots who had arrived in 1687 – two years after the revocation of the Edict of Nantes – to escape persecution for their Protestant beliefs. It was the first parish to be established outside of Charleston, and the area was called the French Santee. The French immigrants wished to establish a community on the river bluff and found the soil along the Santee River to be ideal for planting rice. Many of the settlers flourished by growing of the cash crop. These Huguenots, enjoying their prosperous new world along the Santee, may have joined the Anglican parish system for several reasons. The Church of England became the official church of the colonies in 1704, and the Church Act of 1706 established parishes as administrative, political bodies. Parish status had to be granted by the Church of England, and obtaining parish status ensured members a minister whose salary was supplied by the Anglican Church. Belonging to a parish also afforded political opportunities within the parish system, as parishes had voting rights. Many French settlers eventually intermarried with English families, and assimilation to the Anglican way of life became inevitable. Because the worship services of the Huguenots and the Church of England were similar, many French settlers did not object to Anglican services, particularly when the French were permitted to worship in their native language. 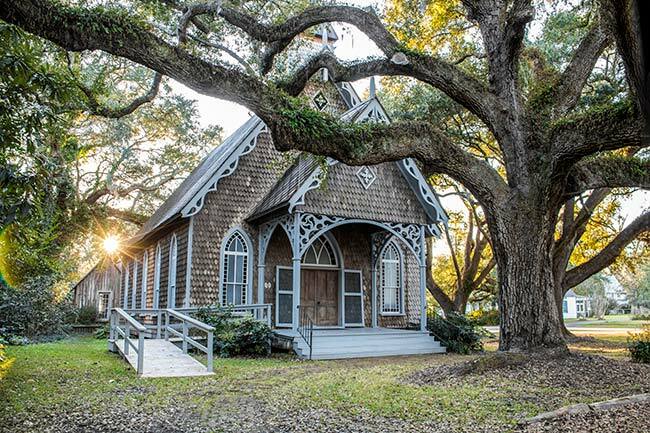 This chapel was the sixth church built within the St. James-Santee Parish and became the primary church after the Civil War, when rice plantations along the Santee, which depended upon slave labor, were abandoned and former planters moved to more central locations such as McClellanville. The church is framed with native longleaf pine and cypress. The roof and exterior sidewalls are covered with black cypress shingles which were individually shaped with a handsaw. 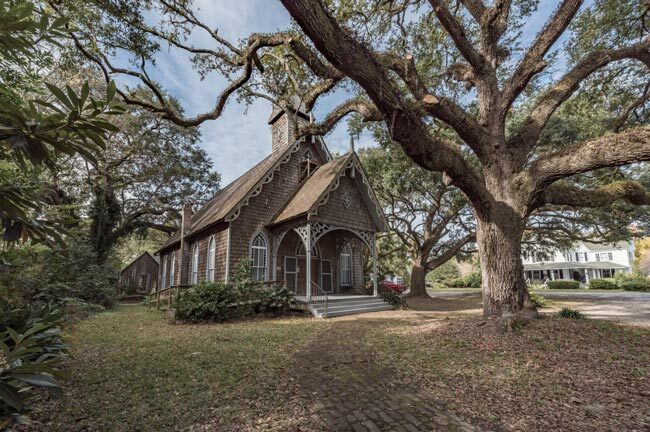 The McClellanville Historic District contains a collection of approximately 105 residential, commercial, religious and educational properties dating from ca. 1860 to ca. 1935. This collection is architecturally significant as an illustration of the founding of a pineland resort village and its development into a small but stable year-round commercial fishing village. 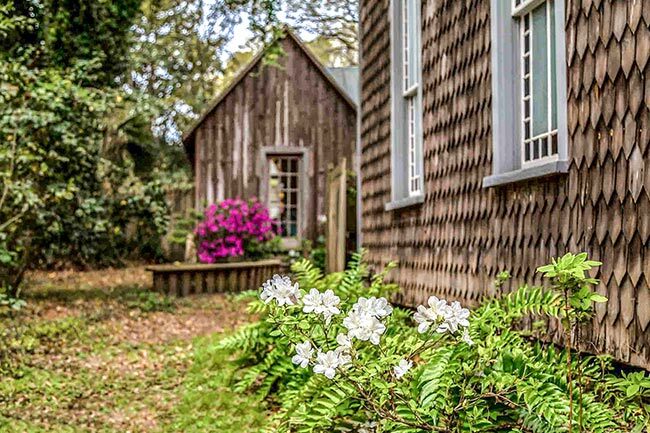 McClellanville begin in the late 1850s as a summer retreat for St. James Santee and Georgetown planters. The prevailing vernacular forms, especially the central hall farmhouse, predominated in early McClellanville architecture, although the more fashionable architectural styles began to receive attention and can be seen throughout the town: Carpenter Gothic, Queen Anne, and Italianate with a rare Colonial Revival example. The commercial strip developed in the early 20th century and are of frame construction built directly on the road. The historic district is visually unified by the nearly ubiquitous wooden frame construction, by the consistent scale of the house, lots, and their relation to the banks of the creek, by the tremendous live oak trees that permeate the town, and by the relative absence of contemporary commercial intrusions. 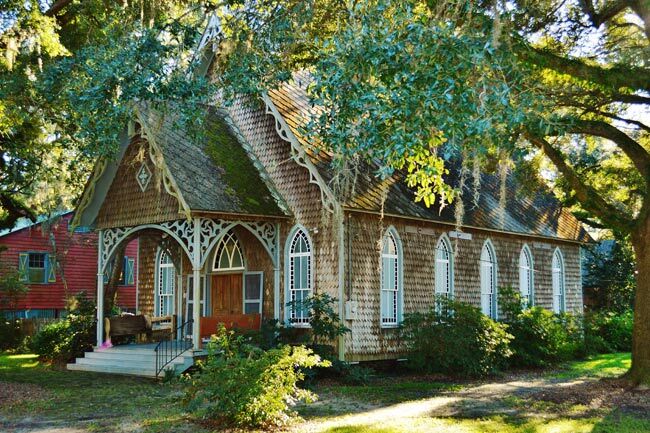 Bud Hill, McClellanville’s resident historian, sends us this valuable information about the St. James-Santee Episcopal Church: “My great-great-grandfather, Dr. William Thomas Wilkins Baker, had the idea to build this beautiful little chapel. He was also the head of the building committee. The church was built for $560. Paul B. Drayton, the amazing ex-slave builder, was the contractor, finishing it in 1890. Sure! Visitors are welcome, it is the Sunday after Easter every year. Will have to double check on the time but believe it is always at noon. There is always a dinner on the grounds afterwards, every visitor brings a covered dish along with utensils, place to sit, etc. Can you tell me about the annual(?) service at the Old Brick Church? When/what time is it? Are visitors welcome? Is it just a service, or is there an event after the service? Thank you. So glad to hear you both enjoyed your trip! We think you may be referring to Bethel AME Church in McClellanville (which is in the St. James Santee Parish). The churches that bear the name of St. James-Santee are both in immaculate condition. Bethel AME is a more gothic looking structure with shingled siding and a red tin roof. 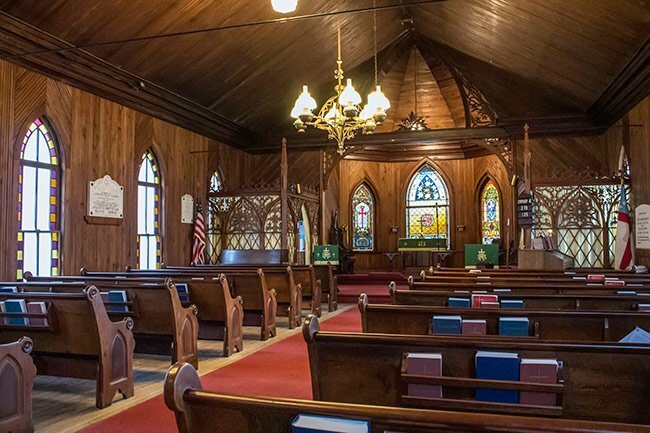 Here is the church we think you may be referring to: https://www.sciway.net/sc-photos/charleston-county/bethel-ame-church.html. A friend and I came to your town yesterday for the first time. 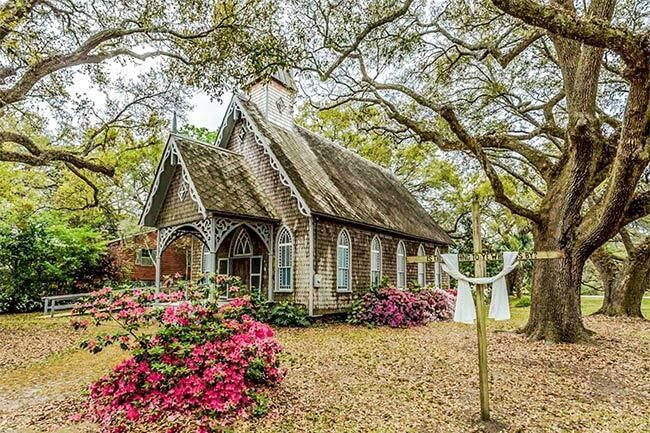 We loved everything about it but especially the church St James Santee Episcopal Church. We were so sad though to see that it had not been kept up at all and that wasn’t even a name or date on it so when we got back home I went on the computer and Googled it to find out the name. That was one of the best things we saw in the town but we were so sad to see the shape that it was in. Yes, it is! This was considered the Chapel-of-Ease which would have been a chapel that was closer to many homes in early times.